I run pretty much every day (excluding the day off every week/2 weeks). Thus, almost everywhere I travel, I run. That’s pretty awesome when you think about it – all you need is shoes (and a sports bra), and no matter where you are in the world you can go for a run. It’s just one more aspect of running that makes it unlike anything else. For me it’s definitely a stabilizer – whether I’m running through the streets of Ouagadougo or on Northern California trails, I’m just a runner, going for a run. With this in mind, I have decided to add a new “series” to my blog: The Places I’ve Run. I’ll just jump right in and start by telling you about running in Niger. 1. That’s the only place really outside the US that I have traveled. 2. Running in Africa was quite the adventure. 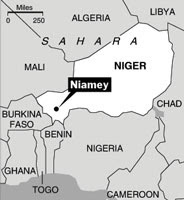 Niger has different social/cultural values than America (duh), one of which is that you cannot wear shorts in public. Not in a people-throw-rocks-at-you sort of way. 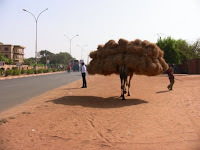 But shorts in public in Niger is basically the equivalent of walking around in your underwear here in the States (you could, but you just don’t). And considering the fact that it was 600 million degrees all the time, not being able to run in shorts would have been a major problem. Ok, ok, 600 million degrees is a bit of an exaggeration. I actually have no idea how hot it was – I did not look at a thermometer the entire time I was there (and daily weather in newspapers/TV simply does not exist). Why not? you may wonder. Well, when it’s freaking hot today, and you know that it will be freaking hot tomorrow, just as it was freaking hot yesterday, there’s really no point in checking the weather. It would be depressing. Luckily for my mal-adjusted self, there was a tiny loop-hole in the no-shorts norm. 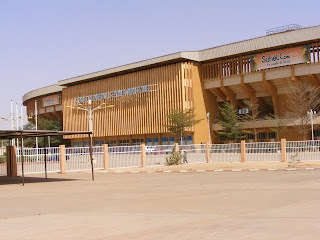 About 2 blocks away from my house, Niger had a huge National Stadium - aka Le Stade (built for the Fracophone Games in 2005), where it was socially acceptable to exercise in exercising attire. My Nigerienne RA accompanied myself and another student the first morning to help us negotiate the terms of our workouts with the Stadium guards. As far as I know, she explained to them (in Zharma) that we would be coming to run in the mornings, and we needed them to “watch” our pants/skirts while we did so. Done. Babu masala (No problem). From then on, my friend and I walked to the stadium wearing pants or a skirt over our shorts. When we arrived, we left that excessive clothing with the guards, ran (or walked in her case) our laps of the giant asphalt complex, and retrieved our clothing before returning home. About a month in, we arrived per usual (Fofo! Ngoya. Ni kani bani? Bani samay! ), but before we could get going, the guards stopped us before we could take off our extra clothes (Attende! Attende!). We were confused, Are we not allowed to run anymore??? What’s going on??? Guard: C’est pas bon pour les femmes deshabiller ici. C’est pas bon. (It is not good for women to undress here. It is not good.) This statement was accompanied by tsk-ing and head-shaking. He then led us to a door in the stadium, which he unlocked and opened. It was a storage closet. To the approving nods of the guard and his friends (there’s never just one guard in Niger), we emerged from the broom closet in our shorts, ready to run. And that was how it went for the rest of the semester. Lesson learned: It is just not ok to drop your pants in public in Niger. So Very Grateful for Running! Bacon + Chocolate = Yum? Sidenote: I don't look "Elite"
6x6 Runner: Week 6, Last Weeeekkkkkkk!!! !